Colorful, healthy, delicious and kids-friendly You can’t help, but taste it! 1st layer – pitaya, also known as dragon fruit, 1 cup coconut meat, 1 banana and 1-2 medjool dates, 1/2 cup coconut milk (unsweetened). 2nd layer – chocolate protein powder, 1 cup frozen black cherries. Blend well each layer’s ingredients in a high speed blender. I used Vitamix. 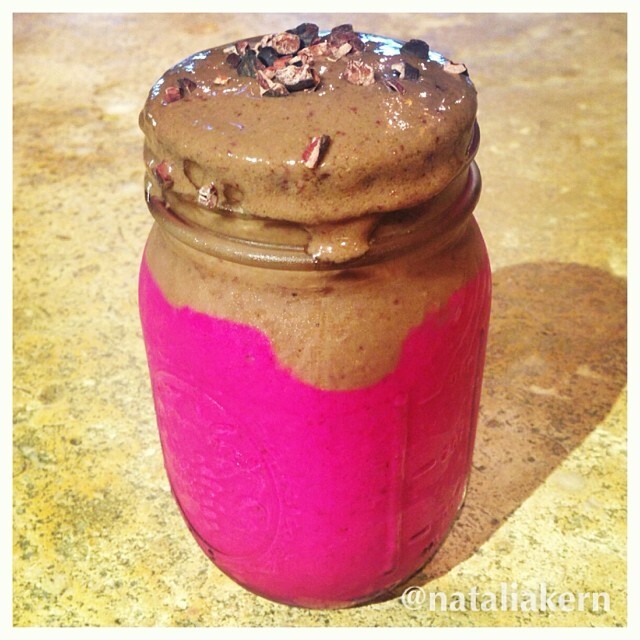 Layer it in mason jar or your favorite smoothie glass and sprinkle it with cacao nibs.